SPINOSO 90 • SHOPPING CENTER BUSINESS • May 2018 I n today's world, we are inundated by headline news proclaiming the death of malls, and the decimation of brick-and-mortar retail in favor of online shopping. However, there is an abundance of evidence that malls are not only viable, but they can in fact thrive and be re-established as centerpieces of their communities. That's a reality that is be- ing proven by Spinoso Real Estate Group. The company is successfully transforming under-performing, dated malls into the thriving places they were designed to be. Based in Syracuse, New York, Spinoso is led by real estate veterans Carmen Spi- noso, who serves as chairman and CEO, and Tom Herman, who serves as presi- dent. The two originally met while work- ing at Wilmorite, a mall developer, in the early 1990s. Spinoso Real Estate Group draws on its principals' expertise in the regional mall business. 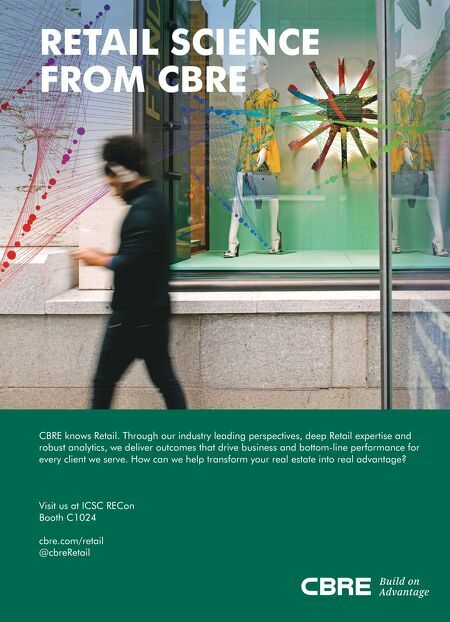 Since the company was founded in 2009, it has owned, man- aged, repositioned or leased more than 35 regional malls. Carmen Spinoso's philosophy on what a regional center should be is founded in his love for the mall business. In the late 1980s, Spinoso went to work for The Pyr- amid Companies as a leasing representa- tive. He realized quickly that the tenant mix was the key to a center's success. "If you have the right collection of retailers, dining establishments, entertainment ven- ues and services, it will compel consum- ers to come more often, stay longer and spend more," says Spinoso. Fresh from graduate school, Herman went to work for a retailer. After a few years, he joined Wilmorite. It was there that he met Spinoso in 1993. Working together, they found a way to combine leasing and research to find a match with retailers and consumers. 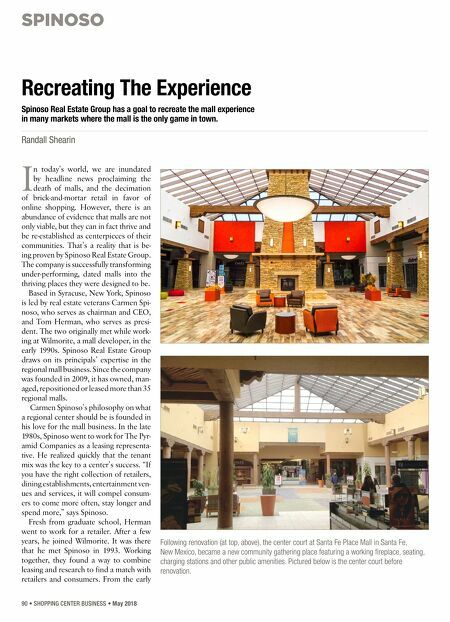 From the early Recreating The Experience Spinoso Real Estate Group has a goal to recreate the mall experience in many markets where the mall is the only game in town. Randall Shearin Following renovation (at top, above), the center court at Santa Fe Place Mall in Santa Fe, New Mexico, became a new community gathering place featuring a working fireplace, seating, charging stations and other public amenities. Pictured below is the center court before renovation.